I just created a new project with Visual Studio 2010 and ReSharper build 2163 and immediately ran into an issue with ReSharper not recognizing NotImplementedException. 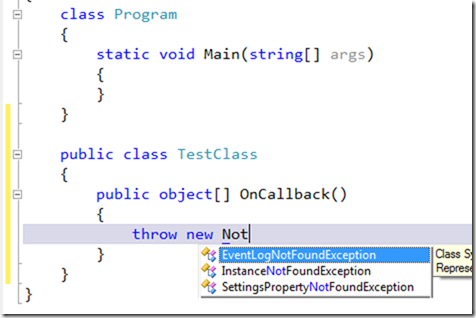 If I continue typing NotImplementedException();, ReSharper recognizes it as a valid reference. It’s just not showing up in the dropdown. for you with ReSharper 6.0 RC? Thank you!